Ms. Jones Dulin joined FGMC in 2015. Ms. Jones Dulin obtained her law degree from Drake University Law School in May, 2003 and she achieved a master of law degree in Health Law in May, 2005 from St. Louis University Law School. Within the practice of law, Ms. Jones Dulin has been driven by an unrelenting passion to help those people who have been harmed through no fault of their own. Ms. Jones Dulin has honed her skills through trying multiple jury trials and has brought hundreds of cases to resolution through settlement. 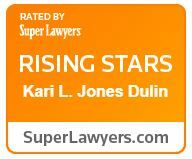 In July, 2014, Ms. Jones Dulin attended the one-month Trial Lawyers College in Dubois, Wyoming and Ms. Jones Dulin remains committed to advocating for her clients in the courtroom. Ms. Jones Dulin has developed a civil litigation practice, with a focus in plaintiff’s personal injury. 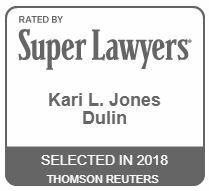 Ms. Jones Dulin has represented those who have been injured as a result of a motor vehicle collision, a dangerous premises, medical malpractice or any instance where an injury occurred because someone broke the law. Ms. Jones Dulin believes that every client has a story to tell and there is no better place to tell that story than the courtroom.